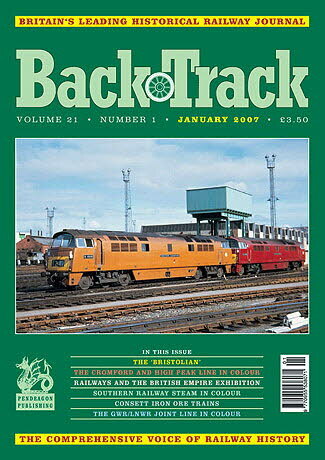 Railway Magazine | BackTrack Jan 2007 journal from Pendragon Publishing. Steam at the Peak - colour feature on the Cromford & High Peak line. Pride and Polish: The story of the 'Bristolian' - Keith Hill tells the story of the famous Paddington to Bristol express. Consett Iron Ore Train Regulations - J. Crosse looks at the practicalities of carrying iron ore from port to steel plant . The Beautiful South - colour feature of Southern Railway locomotives pre-war. At the End of the Day - L.A. Summers offers some views on the trials and tribulations of BR Western Region during the modernisation years of the 1950s and 1960s. Railways on Stage - a review by J.D. Bennett of stage plays based on railway subjects. Watching 'Westerns' in Colour - four colour pictures on 'Western' diesel-hydraulics in different liveries. Lost in Leicestershire - colour feature by Tommy Tomalin on the GNR/LNWR Joint Line from Leicester Belgrave Road. HR/LMS and GNS/LNER Joint Passenger Through Train Workings between Inverness and Aberdeen - by Keith Fenwick and Peter Tatlow. A Narrow Gauge Class 5 - colour feature by Derek Penney on the County Donegal Railway. More Eight-Coupled - A Miscellany - Michael Rutherford investigates the development of the eight -coupled express locomotive. Railways and the British Empire Exhibition 1924-5 - by Jeffrey Wells. Calling at these stations - six colour photos of country railways stations: Levisham, Llanfair PG, Glan Llyn Halt, Ludgershall, Crianlarich Lower, Andover Junction .